As part of a larger study of student understandings of rabbinics—what it is, how it is learned, and what it’s for—it was clear to the research team that it would be important to include the voices of day school educators who teach rabbinics. We interviewed ten educators, including those who teach rabbinics and those who supervise its teaching. We sought diversity by denomination (of the school and its students), geography, perceived sophistication of the school’s curricular approach by the standards and benchmarks team, and the educator’s pre-service preparation (rabbinic ordination, graduate level study of education, academic study of rabbinic text). We asked them how they conceptualized rabbinics and what understandings they wanted to develop in their students. 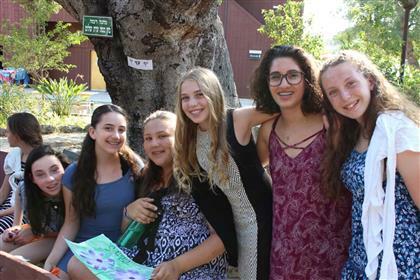 Editor’s Note: Over the last three years, Sarah Bunin Benor, Jonathan Krasner, and Sharon Avni have visited and surveyed Jewish summer camps across North America to learn how Hebrew is incorporated at camp. This research is a project of the Mandel Center, with funding from the Consortium for Applied Studies in Jewish Education (CASJE). Next week at Foundation for Jewish Camp’s Leaders Assembly, the researchers will share some of their findings and offer an interactive space for camps to share experiences and best practices. This spring, they will release findings from the survey portion of the study of Hebrew at camps; a book about the project will be published next year. “Achshav kulam na lavo la’aruchat erev” (Now, everyone, please come to dinner), said one young man to the other madrichim (counselors) and chanichim (campers) at Habonim Dror Camp Galil, a small progressive Zionist summer camp in Pennsylvania. From the kikar (square), not far from the gan (garden), they entered the chadar ochel (dining hall). Several Hebrew words were featured on plaques above the mitbach (kitchen). Soon after dinner, they sang and danced to Hebrew songs like Lo Yisa Goy and recited the blessings for Havdalah in Hebrew. With all this Hebrew, it may seem that Camp Galil is geared toward Israelis and other Hebrew speakers. However, this is not the case.